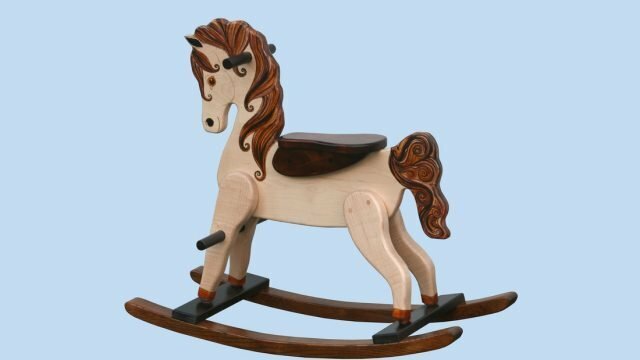 When I was a little girl, a rumor went through school one day that there was a child in our class who owned a rocking horse. For weeks, it was the topic of conversation in the playground. Who could it be? Could it be true? What would it look like? And more to the point: Who had given it to them and why? Then, on a Wednesday morning, our teacher told us that we had been invited to the house of one of our classmates that afternoon. We were going to have tea and she was going to show us the fabled toy in question! We were absolutely beside ourselves. First of all, having tea sounded like a very grown-up thing to do. But that was nothing in comparison with the treat that awaited us afterwards. It was an official invitation, to all of us; and our teacher was coming too. Something enormous was surely about to happen. I can’t remember very much of what happened that day, but the rocking horse itself is etched in my mind. We got to see it from a safe distance. Little groups of four or five of us, standing in the doorway of a playroom. Let me say that again: a playroom! A room dedicated to playing. Only, with toys in it. And a lovely large window with light streaming in onto a table where you could draw pictures. Well, not us, but somebody. The child who lived there. And there was the rocking horse, that looked like it was real. With a mane, and a leather saddle, and reins. We were impressed. And just a tad jealous. I remember that feeling especially, because it was new to me. To most of us. Our world was nothing if not equal. As in: none of us really owned anything. This sounds like I am talking about a million years ago, but this was the 1960s. Siblings shared bedrooms, toys, sometimes even beds. I had never even heard of playrooms, and if I had not seen it for myself I would never have believed they existed. Mostly, we did our playing under the kitchen table or outside, with whatever came to hand. My sister had once been sent a little porcelain tea set by an aunt in New Zealand, but that had been put high in a cabinet; clearly not for playing. Jealousy, or envy, was limited to moments. When somebody got an extra lolly, or more attention. Usually, it didn’t last long, because we were in the same boat and tomorrow it would be your turn for something extra. That is why the rocking horse and the playroom made such an impression, I think. Because it made us realize, for the first time, that some people had a lot more than others, not just a little. Happily, she was the only one we knew, so that limited the envy, for some reason. I think it made her strange instead of special, spoiled instead of lucky. In the end, it also isolated her. Although we were impressed, we were also a little scared of all that luxury and decided that she clearly wasn’t one of us. Following the cruel logic of children, we started to ignore her, until finally she left, bound for a boarding school in Belgium, where big differences in rich and poor were normal and accepted. One of the reasons there is an epidemic of depression is that we are all envious of each other, and that this envy mostly originates from social media like Facebook. I am telling you all this, because I was reading about depression the other day. More to the point: I was going through some research that seems to suggest that one of the reasons there is an epidemic of depression is that we are all envious of each other, and that this envy mostly originates from social media like Facebook. You can understand how the argument goes: we put our best foot forward on Facebook, post lovely pictures of our lovely children, our lovely job, and our lovely friends. Whether we think they are lovely or not. As a result, people start to believe that we actually live like that. And they feel envious. They start to wonder why their husband doesn’t have a six-pack and their children still can’t read at two. Must be something wrong with them, surely. So then, they feel sad and depressed. We, on the other hand, have overplayed our hand a bit. Although our lives are nice enough, they are not without problems. But when we want to talk about those, we realize that we can’t. Nobody would believe us, because we told them we had the lovely everything. We have isolated ourselves, and that makes us feel depressed as well. Win-win: one action, one medium, everybody depressed. First, this news made me a little sad, dejected, and unhappy. But then my mood changed dramatically. If this is the reason we are depressed, then the solution to the epidemic is easier than I, and probably the experts, ever thought possible. And no, I’m not going to advocate getting rid of Facebook. On the contrary. If Facebook has the power to make us feel horrible, it might also be able to lift us out of our despair and misery. The only thing we need is a pledge. Or an oath. Like the one at Eureka: “We swear by the Southern Cross to stand truly by each other and fight to defend our rights and liberties.” What do you think of: “We swear by the Southern Cross to tell the truth about ourselves, on Facebook and in our daily lives, and stand truly by each other and fight to defend our right to feel sad one day and happy the next.” Allowed to be normal. Wouldn’t that be a relief? Are you with me? Read, for instance, Aurel Pera: “Psychopathological Processes Involved in Social Comparison, Depression and Envy on Facebook”, Frontiers in Psychology (22/09/2018); and Helmut Appel, Alexander Gerlach, Jan Crusius: “The interplay between Facebook use, social comparison, envy and depression”, Current Opinion in Psychology (2016).